Can there be a better way to express your love than by baking and giving homemade Valentine cookies? You needn’t be an expert baker or take hours of your time. Baking cookies is a simple (and inexpensive) way to give a personalized gift or to make a simple treat to celebrate the holiday. You can make easy cookie recipes created just for Valentine’s Day or adapt other cookie recipes for the holiday. That’s why The Elf recommends baking cookies as gifts of love for family and friends. The ultimate definition of “sweet,” a sugar cookie recipe and a heart-shaped cookie cutter together are a classic Valentine treat. You can make an easy sugar cookie recipe and decorate the cookies with frosting, royal icing (here are some tips), and all kinds of decorations (like these). Or sugar cookie cut out hearts can be paired together and filled with jam or jelly to make Valentine sandwich cookies. Long considered an aphrodisiac (although studies have yet to conclusively confirm it), chocolate has become the number one Valentine gift, making chocolate cookies a favorite homemade giveaway. Whether from red and pink tints in cherries, their well-matched pairing with chocolate, or the association with President’s Weekend – particularly George Washington (born February 22) of cherry-tree-chopping fame – cherries are a popular Valentine cookie flavor. Use your favorite sugar cookie recipe, chocolate chip cookie recipe, or other cookie dough to bake a giant cookie or a brownie pizza for your Valentine. Frost the giant cookie with a personalized message. A cookie bouquet of cookies on sticks (also called cookie pops) can take the place of flowers … and taste better. Decorate them with Valentine’s Day sayings. Or break up your quote into several shorter phrases or individual words and pipe each phrase on individual cookies. Arrange the cookies in order in the bouquet. Frost sugar cookies with cream cheese icing, vanilla icing, or chocolate icing. Dip cookies in melted dark chocolate, melted white chocolate, or pink chocolate melts. Use a fine tip on your piping bag or ready-to-use icing tubes to outline the edges of your cookies or write a message with icing on your cookies. Decorate cookies with red, pink, and white sugars or Valentine sprinkles. Personalize your cookies with a special message you pipe on the surface with an icing tube or piping bag. Make your heart-shaped cookies into conversation hearts, using short, pithy sayings. Package your Valentine cookies in red, pink, or clear cellophane party favor bags. Package your cookies in clear storage bags and tie them with pink ribbon, red ribbon, or a piece of lace or pink or red ribbon around the neck of the bag. 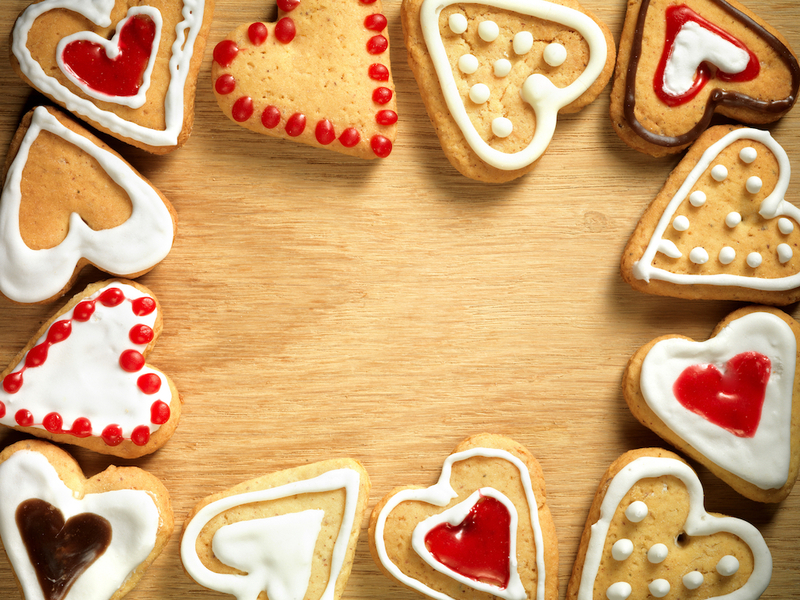 Even if you don’t have time to bake, cookie gifts for Valentine’s Day are a sweet treat. You can order and send cookie bouquets, cookie tins, cookie gift baskets, gourmet cookies … or better yet, deliver them yourself, in person.